I have taken an interest in Hwange National Park’s Elephants. The Park is extremely overpopulated. Using the table below (@ 15% biomass) as a guide, I did some basic calculations. Next step, some sources have Hwange National Park’s average annual rainfall at 560mm. If one would take drought conditions into consideration it would be 112×32.44 = 3633 Elephants @15% Large Herbivore biomass. @ 45% Large Herbivore biomass it would be 336×32.44 = 10 900 Elephants. It is thus imperative that the Elephant population in Hwange should be maintained @ between 10 000 and 15 000. However, much damage has already been done, it might be required to bring the population down to 15% Large Herbivore Biomass, i.e. around 5000 Elephants. Let that sink in. Hwange National Park has an estimated 54 000 Elephants! 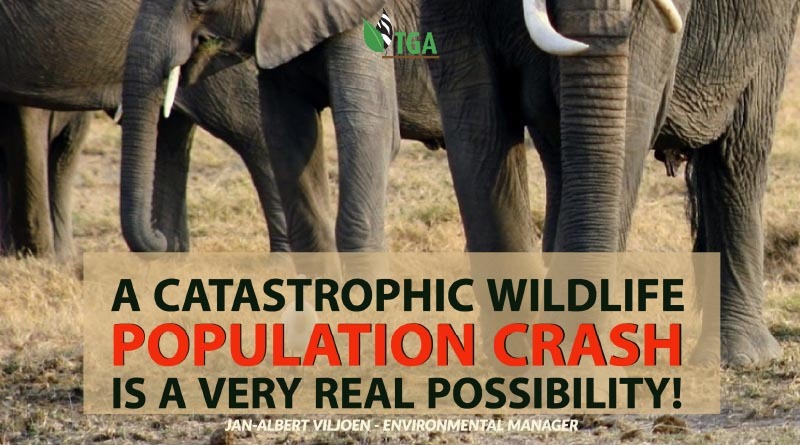 A catastrophic wildlife population crash is a very real possibility! Author: Jan-Albert Viljoen. Environmental Manager. Why can’t it be less expensive yo hunt them? I do not quite understand the comment. The post deals with an overpopulation, not a financial burden. I doubt if safari hunting alone with foreign clients would reduce the elephant population enough to remedy the situation. There is currently a moratorium on the export of elephant trophies from Zimbabwe to the USA which has by far the largest trophy hunting client base. What needs to happen is that the US must allow the importation of ivory from legally hunted elephants and a well-planned culling operation needs to take place also. Funds generated from trophy hunting are essential for the conservation efforts of numerous countries, including Zimbabwe. Can the rest of the world wake up , it seams that nobody cares a dam about Africa and the animals, or the human population that has exploded and there is no end . The human population should be checked. you´re totally spot on in your comments. I fully agree with you, and with everything that Ron says/writes/does re this issue of elephants in Southern Africa. I think the tipping point was reached a long time ago, and culling has become a necessity, not an option anymore. But hey… with 99% of the world´s population swallowing hook, line and sinker the nonsense babbled by animal rightists and other moronic NGO´s, plus the messages that certain wildlife docs (many made through powerful companies like Nat Geo) are sending to them (needless to say that the vast majority of those people have never set a foot in Africa, and have zero knowledge of how things work there), I can´t for the sake of me see how those tables are going to be turned. They have almost managed to close all the markets in the world where ivory can be received, and they are pursuing the banning of all hunting in Africa. It´s becoming public knowledge for everyone that follows these issues. African countries (at least SA, Namibia, Zim, Mozambique, Zambia and Tanzania) should send CITES packing down the road, but as Ron has correctly stated, it´s gonna be a hell of a mission due to the buying of votes. I was in Kenya a couple of weeks ago and I managed to almost convince a guy about the convenience of having to do some big elephant culling operations in Southern Africa, apart from explaining to him who is behind the big poaching rings. He didn´t trusted a word I was saying to him in the beginning, but as the conversation was starting to tilt towards me… he was willing to give it a serious thought. He said he needed a bit more proof, so I told him about TGA. Anyway, this is an uphill battle which I´m not convinced at all that will end positively for TRUE conservationists.